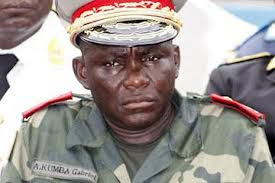 In important developments last Thursday, on 31 July, Congolese authorities cleared all charges leveled against General Amisi Kumba, former commander of the Congolese land forces. Amisi was suspended on 22 November 2012 following accusations made by the United Nations Group of Experts that he “oversees a network distributing hunting ammunition for poachers and armed groups, including Raïa Mutomboki” and Nyatura. The Rwandan government further asserted that Amisi contributes weapons to the FDLR rebel group. Amisi is also accused of a number of war crimes including widespread killings, summary executions, rapes, and pillage. For now, it remains unclear whether Gen. Amisi – also known as Tango Four – will resume his earlier position currently filled by Gen. François Olenga. During his suspension, Tango Four presided over a famous sports club in Kinshasa know as AS V Club. While the Group of Experts has yet to respond, members of civil society in North Kivu has expressed its disappointment, urging authorities to investigate the case further. Clearing Amisi of serious charges and possibly reinstating him as chief of the ground forces might be a move to revive a long-standing loyalist to President Kabila. Kabila is facing growing opposition for threatening to change the constitution in order to run for a third term in the 2016 elections. Similarly, Kabila might use Amisi to keep the army in check, whose base in Kinshasa was attacked under mysterious circumstances on 22 July. Like Prime Minister Mponyo and a number of high-level political insiders, Amisi also hails from the province of Maniema. Amisi has a long military career, serving as officer under President Joseph Mobutu’s army FAC. In 1996, he joined the AFDL rebellion, which ousted Mobuto and was supported by Rwanda and Uganda. During the Second Congo War, he became the assistance chief of staff for logistics of the RDC-Goma, a rebellion also spearheaded by neighboring Rwanda. His nicknameTango Four stems from is radio signal T4. In May 2002, next to Laurent Nkunda, Amisi was among the RCD-Goma officers allegedly responsible for the repression of an attempted mutiny in Kisangani where more than 160 persons were summarily executed, according to Human Rights Watch. Irrespective of the allegations, authorities promoted Amisi to head of the army in North Kivu in 2005. Just a year later, hebecame the commander of the land forces. Next to Bisie, the Group asserted that “according to multiple credible sources and extensive documentation, General Amisi has inserted himself into an ongoing conflict over the rights to Omate [gold mine in Walikale] in exchange for a percentage of the production.” Amisi has reportedly been allotted his own mining pit and Congolese government officials referenced five separate officers who were working for Amisi while deployed at the mining sites of Irumu, Aru, Mambasa and Mongbwalu. Global Witness gathered similar findings in December 2010 (here) and May 2013 (here).